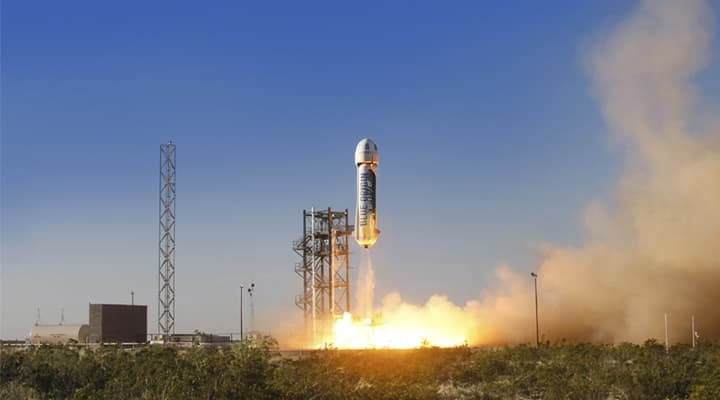 Blue Origins, founded by US entrepreneur Jeff Bezos, has demonstrated the re-usability of their New Shepard rocket in a test launch that took place on January 22nd, at a test and launch facility in Texas, USA. The New Shepard rocket, which had its first flight in November 2015, reached a height of 101.7 km above sea level before returning to the launch site with both booster and capsule intact. A lot of emphasis has been placed on re-usable rockets these days, due to the fact that they reduce the cost of space missions considerably. The rockets do not have to be discarded after every use, which greatly reduces material wastage also. Blue Origins, along with entrepreneur Elon Musk’s SpaceX, are the forerunners in re-usable rocket technology. The rocket used for the launch was the same one used in November, with several software updates, including an update that allows the vehicle to better resist the disturbances created by low altitude winds, thereby increasing its landing efficiency and safety margins. At 100kms, the New Shepard has only just touched the boundary of space. Although the rocket is currently not capable of achieving the thrust capacity required to reach and maintain a permanent orbit around the Earth, Blue Origins is developing engines that will soon allow its vehicles to achieve stationary orbit. The engine used in the launch was Blue Origins’ own BE-3, developed at their headquarters in Washington. The BE-3 is a single combustion chamber engine that uses liquid hydrogen and liquid oxygen as fuel, producing water as a byproduct with no carbon emissions. It is capable of achieving a 110,000 pound thrust at take-off, and a 20,000 pound thrust during landing. Blue Origins is currently developing an advanced engine, dubbed the BE-4, which is five times more powerful than the BE-3, and will be used in future missions of the New Shepard and other vehicles the company developes. The company also has plans for conducting manned space flights in the near future, and is developing bigger, better equipped vehicles. The concept of “spaceships” might become a reality sooner than we think.